ONCYTE® is a three-dimensional microarray comprised of a combination of nitrocellulose polymer and proprietary chemistry that provides increased protein affinity and binding. It is also provides enhanced fluorescent chemiluminescent, radiographic, colormetric and visual signal compared to glass or other coated glass surfaces. We provide nitrocellulose-coated products that includes anything from standards 25 mm x 75 mm glass microscope slides to SBS microtiter plate substrates in standard and custom formats. Our nitrocellulose film surfaces are manufactured and quality tested to the most exacting standards. To provide an optimal balance between binding capacity and fluorescence sensitivity, we offer two variants of nitrocellulose coatings. The ONCYTE® AVID™ nitrocellulose-coated substrates are for applications that require the highest possible protein binding affinity and capacity. Therefore AVID™ slides are characterized by unparalleled protein binding capacity and affinity, making them ideal for colometric and infrared applications that require extremely high levels of binding. The ONCYTE® NOVA™ nitrocellulose-coated substrates are recommended for applications that require the greatest fluorescent sensitivity but can accept reduced binding capacity. Therefore NOVA™ slides extremely low background fluorescence and an elegant, clean surface make them the most sensitive slides available for fluorescence – dependent arrays. High Definition Cell Analysis IN Situ Using Microporous Films. Cel Vision 2:499 – 599, 1995. Cytometrically Coherent Transfer of Receptor Proteins on Microporous Membranes. BioTechnique 20:641-650. 1991. Slide based low volume, removable chambers for protein binding. A combination of our SecureSeal™ chambers and ONCYTE® nitrocellulose film coated slides that provide an easily removable, low volume chamber and the protein binding benefits of a nitrocellulose coating. 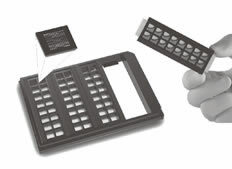 ONCYTE® is a 3-dimensional microarray substrate bound to a standard 25mm x 75mm glass slide. A combination of nitrocellulose polymer and proprietary chemistry maximize protein binding and stability. The film is compatible with virtually all detection systems, including fluorescent, chemiluminescent, radiographic and colorimetric. Please refer to the SecureSeal™ chambers (Click here for details) and ONCYTE® Film Slides (Click here for details) pages for pricing and ordering information. ProPlate™ integrates microscope slide based array technology with automated microtiter plate processing. Up to 64 individual arrays can be assayed per slide. Four slides fit into a tray, producing a modular plate with a standard microtiter plate footprint and well spacing allowing automated robotic processing of up to 256 arrays. Available in Chip Chip™ compatible formats. 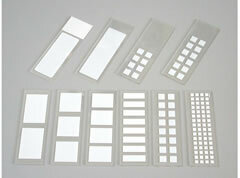 Each ProPlate Tray Set includes: 4 Slide modules, 8 Snap clips, 1 Tray and Cover, 10 seal strips and one applicator. Tray conforms to SBS standards for footprint (81.7mm width x 123.7mm length) and well spacing. Grace BioLabs developed bottomless SBS compliant microtiter plate superstructures for use with robotic processors. TheSuperstructures come in a permanently affixed well format – the ProPlate MP™, or a removable well format – the FlexPlate MP™. The ProPlate MP™ SBS compliant microtiter plate features a SecureSeal™ Plus adhesive bonding system applied to a bottomless 96-round well, black, polystyrene microtiter plate. Simply peel off the protective polyliner and apply large format array for automated processing. 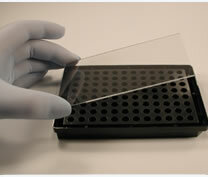 The proprietary adhesive forms a water-tight seal between a microarray substrate and the bottomless microtiter plate. Grace Bio Labs offers plate with SBS standard spacing in both 96-well (shown) and 384-well formats. Compatible with glass or plastic substrates. Available as a complete microtiter plate with microcellulose film coated substrate, uncoated substrate or as an adhesive superstructure alone. Plates are available with SBS standard spacing in both 96-well and 384-well formats. The disposable chamber removes cleanly and easily even after heating. Gasketed chambers provide optimum surface volume fluid dynamics for hybridization assays. Gasket may be sealed for mixing and to prevent evaporation. Available 8-wells and 16-wells. Note: HybriWell™ and SecureSeal™ are recommended for most protein and nucleic acid assays. If you are using CY5® or Alexa Fluor® 647 direct-labeled DNA probes, please refer to our new “fluorescent friendly” chambers for DNA microarrays or click here for details.